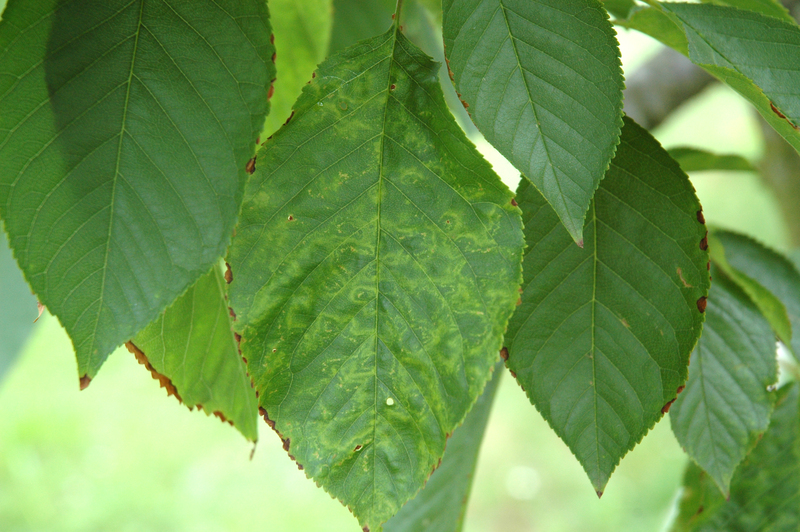 Lapin cherry leaf with ringspots and line patterns due to the Prune Dwarf Virus. Note the healthy tree on the left, and diseased tree on the right. OSU Extension Plant Pathology Slide Collection, circa 1950's. Cause Prune dwarf virus (PDV) is transmitted easily by budding and grafting. It also spreads naturally in the orchard by infected pollen. Thus, there is little spread until trees are old enough to bloom. Spread in sweet cherry is much slower than in sour cherry. Due to pollen transmission, a high percentage of the seeds may carry the virus. PDV may cause up to 50% yield loss in sour cherry, low bud-take in nurseries (40% to 50% compared with healthy stocks) and slower growth of young trees. 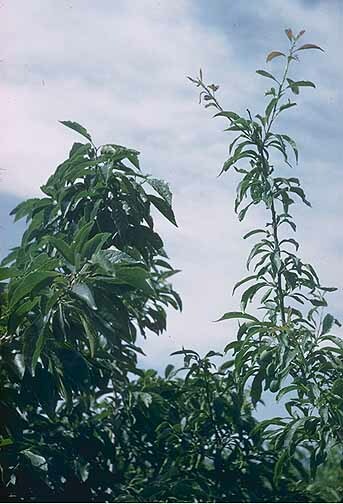 Symptoms Sweet cherry leaves are normal color and vigor but narrower and longer than usual. Although the virus is distributed throughout an infected tree, symptoms may be restricted to one limb or section of the tree. Blind wood also occurs and is frequently seen in trees 25 years or older. Fruit production, although reduced, is on the exterior of the tree. Being more exposed, fruit usually is larger and firmer than fruit grown toward the interior of the tree. Applying gibberellic acid can reverse the development of blind wood. Use virus-tested (and found to be free of all known viruses) bud wood and nursery stock. Establish new plantings some distance from older orchards. Do not rogue or replant extensively in older orchards where yellows are established. However, do rogue in young newly infected orchards if diseased trees occasionally show up. Reference Pallas, V., Aparicio, F., Herranz, M.C., Amari, K., Sanchez-Pina, M.A., Myrta, A., and Sanchez-Navarro, J.A. 2012. Ilarviruses of Prunus spp. : A continued concern for fruit trees. Phytopathology 102:1108-1120.